Risotto is a good basic side dish that everyone should learn to make. You can do so much with a basic recipe to compliment any of your *star* attractions at dinner. 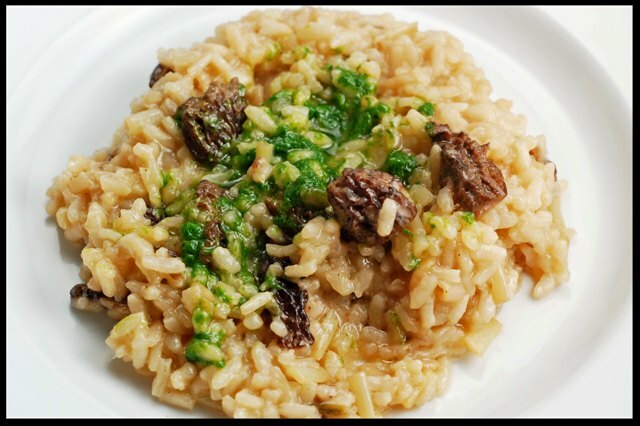 For this Morel Ramp Risotto with Ramp Pesto I used our basic risotto recipe and added wonderful ramps and morels we received last week, from David at Earthy Delights. I did not want the morels to overpower the ramps so I used a small number of morels and doubled the number of ramps. As well I created a wonderful pesto using the leafy greens from the ramps and used some as a garnish. It was amazing. The pesto was slightly spicy and added a nice zing to the creamy risotto. Heat the olive oil and add ramps (white parts), saute until soft, about 5 minutes. Add the morels. Cook over low heat for about 15 minutes. Add the wine and cook until reduced about another 10 minutes. Remove from heat and set aside. Heat stock to boiling, reduce to a simmer. Add the risotto to the pan which you saute the ramps in. Warm the rice for about 3 minutes. Add a cup of the stock and cook until reduced. Add another cup and continue until you have a creamy rice mixture, slightly al dente. Add the butter and stir until creamy, about 3 minutes. Stir in the ramp and morel mixture, cook for 5 minutes. Plate, and then drizzle some pesto over the top. Add ramps to a food processor. Slowly add olive oil and blend until smooth. 12 Responses to "Morel Ramp Risotto with Ramp Pesto"
This sounds really good. I've been thinking about making a pesto again. The salmon with the ramp pesto on Bon Appetit sounded really good. I made something like it the other night, and all I can say is, keep it simple. Ramps are delicate and easily overwhelmed. A little lemon, a little herb, a mild nut, maybe pine nuts or blanched almond? Fabulous risotto with morels and ramps! I would love to try it! Hoping I haven't missed ramps this season. We had one grilling session (my favorite way to eat ramps) and then some travel (Xcountry in four days!) Will have to find some to do this pesto! What an elegant risotto, I should see if anything here "in the wild' remotely looks like ramps! This risotto is oh-so-tempting! 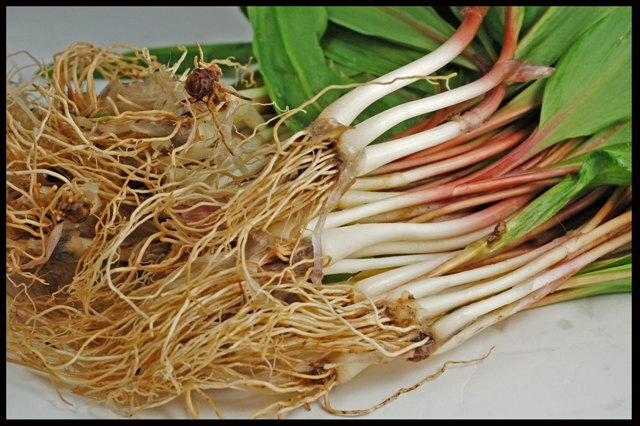 I've never tried ramps (that I know of) and will keep an eye out for them now. Thanks! This risotto sounds wonderfully creamy and seasonal. Thanks for sharing! What a fantastic looking risotto! You certainly did those ramps and morels justice - can't wait to see your pesto variations. This was disappointing. The ramp pesto was really great but it totally overpowered the morels. The morel flavor didn't infuse into the risotto since they weren't in the pan during the rice cooking portion of the show.